Last week from Monday, October 7th until 9pm on October 13th, I spun every single moment I could for Spinzilla – a Monster of a Spinning Contest. I got up an hour earlier than normal and spun in the morning. (Some days that worked better than others.) 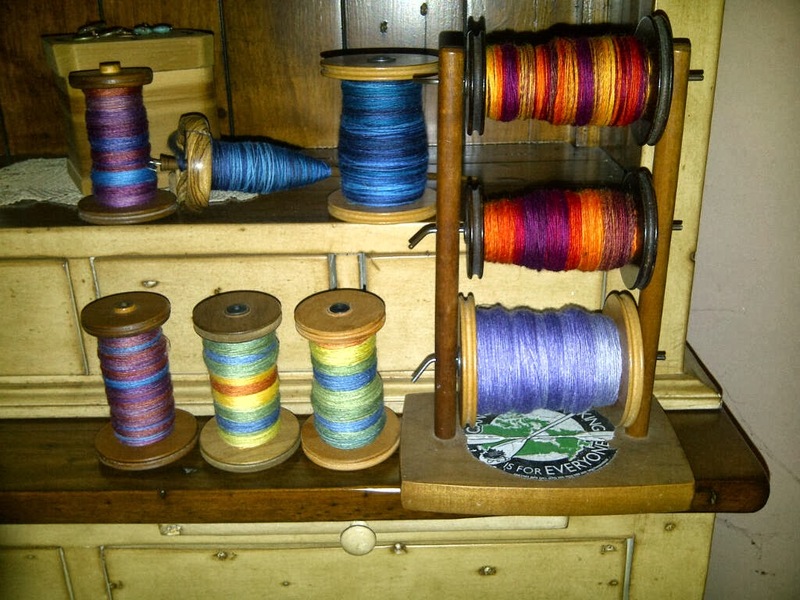 I carried around my Houndesign spindle and spun in the car, on the train and on the bus during my commute to the city. It is not easy to spin on the bus. You don’t have much room sitting down, and it’s impossible to do so standing up what with all the starting and stopping. And people stare at you. I am used to folks looking over at me while I’m knitting, but they really STARE at you when you haul out a spindle. And of course, I spun in the evening after dinner. There were many times during the week that my leg or back got sore. When that happened I got up, walked around a bit and then got back to the wheel. Like a marathon, it’s all about pacing yourself. And as you are part of team, you know that everything you do will help the team. 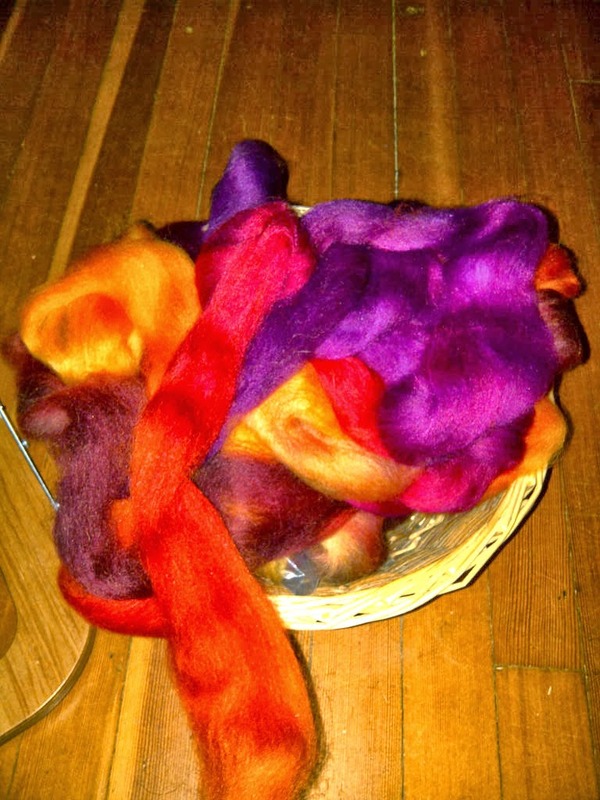 I was on Team Sweet Georgia – as all the fibre I used during Spinzilla was from there. It’s wonderfully prepared and the colours are simply lovely. They propelled me forward. Yesterday was particularly tricky as I was working on a final push – and preparing a Thanksgiving feast. But I got it done. I finished this duo (London Town in Panda) at 8 pm last night. I only had one more hour left and didn’t feel like starting a new braid of fibre. 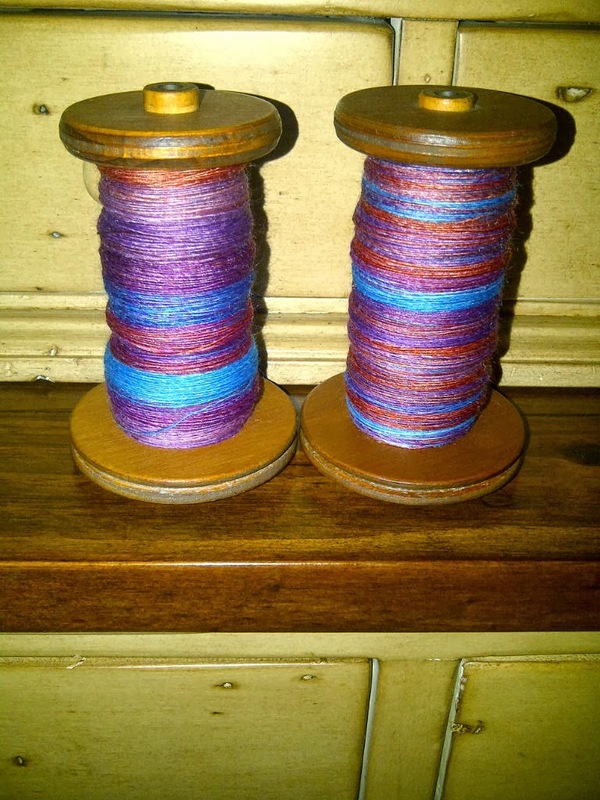 As well, my back and leg were sore, so I got out my spindle and spindle-spun myself until the clock said 9 pm. Done, done, and so very done. The final result was 4,496 yards (4,150m) of singles yarn — from 630 grams of fibre – that’s 1.4lbs. All the fibre I worked with was blended – super fine wool like merino, BFL or polwarth with bamboo, tencel, nylon, and or tussah silk. It was easy stuff to spin fine and once I got going, that was the plan. Yardage was the goal. If the contest was how much weight to spin, I’d have spun chunky weight. But as it was all about the yardage, so I cranked my wheel to the second highest speed and treadled away. Here’s the photo of the entire fleet of spun singles. 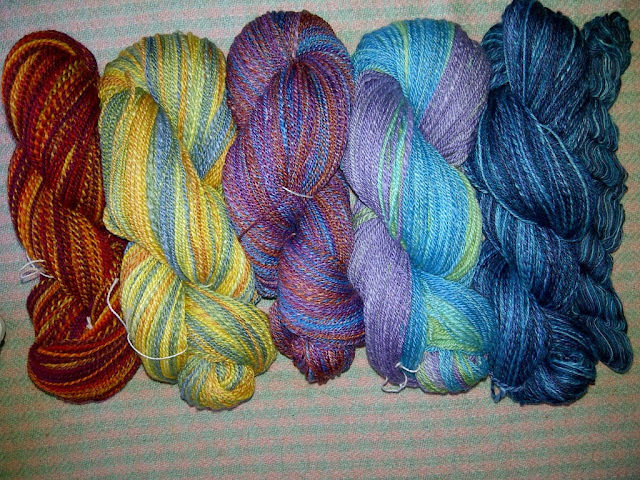 I’ll be spending the next while plying these into two-ply and three-ply yarns and will proudly display the results. Go Team Sweet Georgia — I hope we do well. I know I did my best for the team. And I’d do it again in a heartbeat. This entry was posted in spinning, Spinzilla, Sweet Georgia Yarns on October 14, 2013 by DianaTwiss. 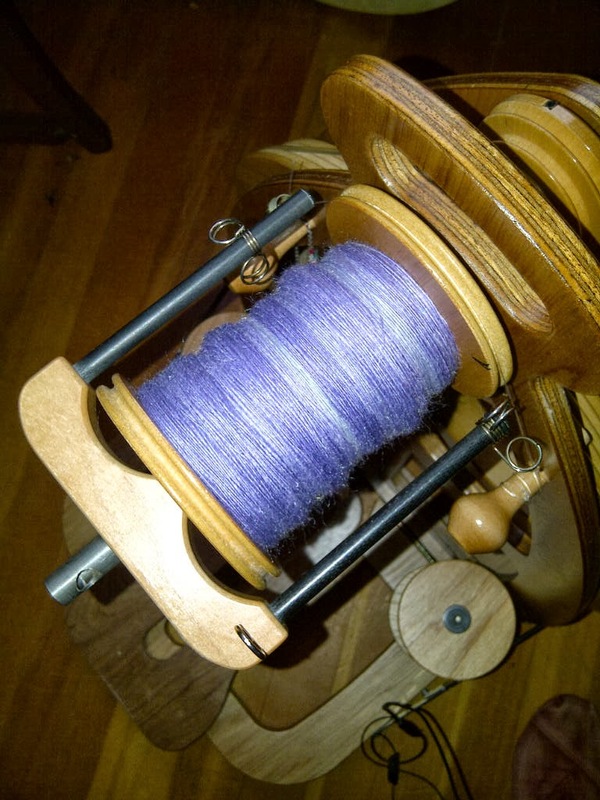 Today is the first day of Spinzilla – a monster of a spinning contest that spans miles and time zones. I am a member of Team Sweet Georgia. (#teamsweetgeorgia) I am working all week so I have to plan my spinning around the work. So, I got up early today and was down at my wheel by 6am. 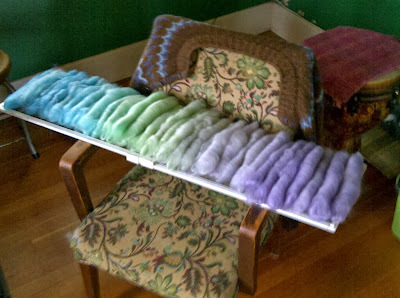 This tray awaited me — 36 carefully prepared rolags that I would spin in order to get an ombre effect. I spun until 9am and then started my (paid) work. 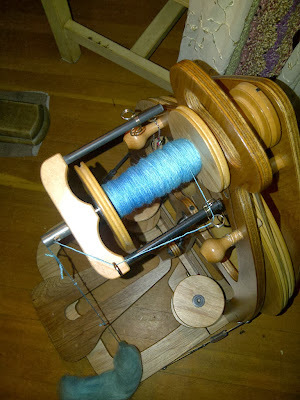 I took three 10 minute breaks throughout the day and spun a rolag. At lunchtime I spun for half and hour. I had a couple of tele-meetings so was able to spin through those. The fibre is Waterfall – merino, bamboo and tencel from Sweet Georgia Yarns. In fact, all the fibre I’m spinning this week is from Sweet Georgia Yarns. They are of exceptional quality and have such amazing colourways, they are a delight to spin. At 5:30 I spun for another 15 minutes and then finished up. Here’s the finished braid all spun up. It weighs 128 grams. That finished I started on the next one – this is a contest after all. There’s no time to rest. Well really, I had a hot bath because my leg was sore. After the bath I spun for another 45 minutes on this – Indian Summer. BFL and 15% nylon SGY. I’ll see how far I get with this while I watch M*A*S*H Season 3. 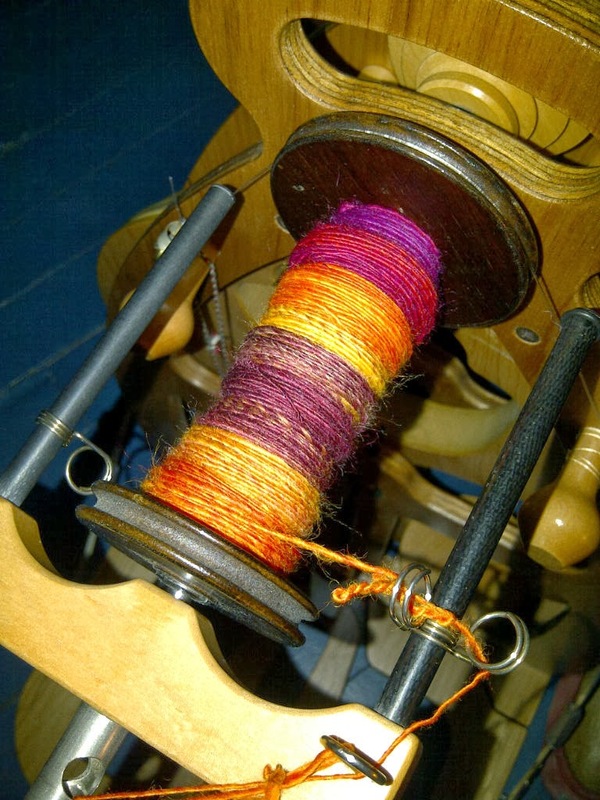 This entry was posted in spinning, Spinzilla, Sweet Georgia Yarns on October 8, 2013 by DianaTwiss.